Answer: 6061-T6 aluminum/magnesium alloy. This is the same material used in the aircraft industry—a very light, very strong material. All tubing is anodized with a clear protective coating. A variety of sizes are used in the frames, depending on the model: 1/2 round, 5/8 round, 3/4 round, 7/8 round, 1/2 square, 5/8 square. How does it fold ? Ingenious design features have been incorporated to each model. The framework assembly of each model has similar characteristics, yet each is uniquely different. Longitudinal sections are shock-corded together like tent poles. To minimize assembly steps, chine and gunwale tubes for both the bow and stern frame sections are permanently attached to keel reinforcements plates. Deck bars are used as lever bars to extend the frame sections tightly into the skin. No additional tools are required for assembly. Because the framework is sectional, should damage occur, the individual section can easily be repaired or replaced. Crosspieces are either hand-cut from high density polyethylene, or are injected molded polycarbonate, depending on the model. Flex of the skin and frame are an integral part of the design and performance of every skin kayak. Some flex at the joints are desirable for the kayak to perform well at sea. We have developed a number of systems for joining frame sections, and attaching crossribs to the framework that have stood the passage of time. What are the crossribs made of? Crossribs in the KLight and the Kahuna are polycarbonate. These are injected molded parts, and the material is lighter in weight than the HDPE used in the larger Expedition boats. The HDPE crossribs (high density polyethylene) are cut on our CNC machine. They won’t crack, peel or splinter. However, over time, the plastic can sometimes curve to the shape of the skin. Soak the rib in hot water, or leave out in the hot sun and they can be bent back. In the beginning, there was no coaming. The spray skirt was built in to the kayak deck. In 1990, we developed a detachable fibreglass coaming rim for the cockpit and we were able to use a traditional style of spray skirt along with our sea sock. In 2005, the cockpit coaming design was changed to be a “built-in coaming”. By 2006, all the models were changed to have this style of coaming. Because of this design modification, assembly has been simplified and worry of breakage in shipping has been eliminated. The spray skirt and sea sock fit as usual. The built-in coaming rim is made of fabric sleeves sewn and welded to the cockpit opening. In the sleeves are sewn 1/2″ high density foam inserts. At the bow and stern ends of the coaming 1/4″ plastic (high-density polyethylene) inserts are also inserted permanently into the sleeves. Separate 1/4″ HDPE side inserts slide into pockets along the underside of the built-in rim. These side inserts are removed when rolling up the skin. The sea socks and spray skirts are attached in the same way as the fibreglass coamings. Thigh brace bars fit on either side of the cockpit. For the best fit of the cockpit, and best bracing, insert the bars; for a roomier cockpit, leave them out. The bars add rigidity to the cockpit which is useful when one lifts the kayak at the cockpit. It is possible to change a skin with the fibreglass coaming to the built in coaming style. This work is very labour intensive, and is a service we can offer only during our quiet winter months. Contact us for details. Sure, Feathercraft did not exactly invent the rudder. But we certainly were the first to make an effective rudder for use on a kayak. Most kayak manufacturers have continued to follow our original concept. As with our kayaks, the rudder too, has evolved over the years. The flip-up surf rudder was introduced by Feathercraft in the late 1980’s, and has become the industry standard design: aluminum wings and fin with a pulley system. In 1994, we began using the current injection molded pulley wheel, making the raising and lowering of the fin simple and smooth. Our rudder fin material is an air-foil, extruded aluminum shape. The aluminum angle and the fins are cut on our CNC machine. This is a computer controlled router machine, adding to the consistent shape and smooth operation of the rudder itself. The rudder block, which holds the mounting pin, is solid delrin, also cut on the CNC machine. The aluminum has been treated with a clear anodized coating to protect against corrosion. However, the frame does require some basic maintenance. When you assemble the kayak for the first time, use BoeShield T-9 on all inserts, spring buttons and parts that slide (such as the extension bars). We recommend cleaning the frame with fresh water and re-lubricating every two months. This will completely depend on the amount of use and also the amount of water that may be entering the kayak. If in doubt – use the two month rule. With the welded skin kayaks, there is significantly less water entering the kayak. 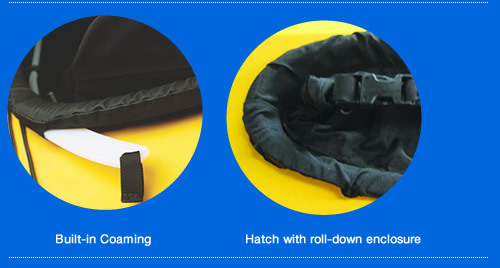 Consistently using the sea sock will keep the inside of the kayak cleaner and drier. When practicing rolling, it is common for water to enter under the lip of the sea sock, because of the shifting within the cockpit. However, if regular cleaning and lubricating have not been done, and the frame has become seized, here’s what you need to do. Generously apply Bo-Shield T-9 to all tube joins. Allow to sit 24 hours. For really bad cases, keep re-applying over a couple of days. This lubricant can seep into small spaces. To help twist tubes apart using vice grips, first wrap the frame tubing with hull scrap, or similar, to protect the tubes from scarring. Use a twisting motion to help free the tubes. Should the worst happen, and nothing works, the frame tubing will have to be cut. Not to worry! Replacement parts are available. Contact us for help and pricing on parts.